The strength and beauty of these dogs is shown in the German Shepherd Address Labels that come in four different poses. These dogs come in a variety of colors that range from black, brown, tan or mixture of all these colors. Dog lovers everywhere will be thrilled with these portraits that showcase each dog as it looks off into the distance. Known for their protective instincts these dogs are natural leaders and very loyal to their owners. Whether they are at rest or standing they are always vigilant and looking out for danger. 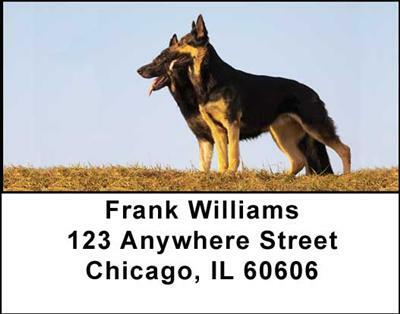 Using these German Shepherd Address Labels will be a way to stay close to your friends that are always faithful.